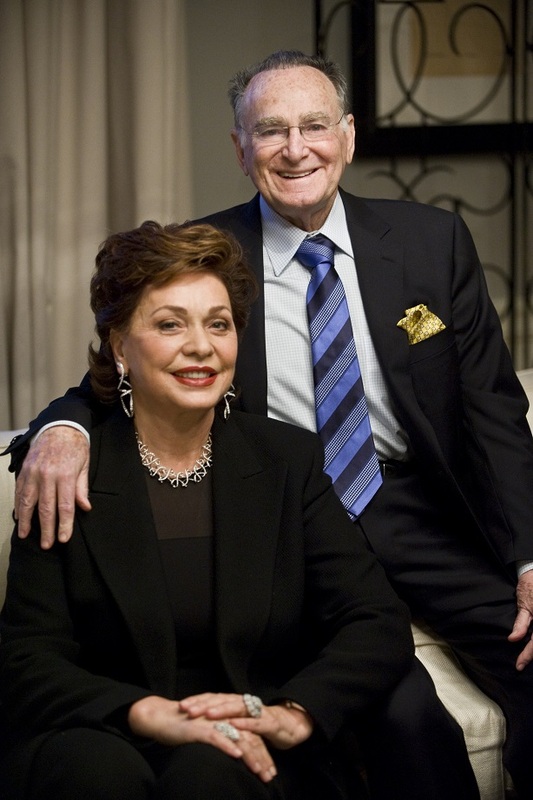 Isaac “Jan” Shrem and Maria Manetti Shrem, benefactors to the Jan Shrem and Maria Manetti Shrem Museum of Art; excerpted from an interview with the National Museum of American History, March 18, 2015. Jan: I was born in Colombia in 1930 of Jewish-Lebanese parents, who had immigrated to South America during the Great Depression. When I was two years old, my mother went to live in Jerusalem, where she had family, and where I lived until I was nine. In 1939, my mother returned to my father in Colombia, and I was there until I became 16. With the help of a sister of my father, who lived in New York, I obtained a resident visa and was able to get passage on a freight airplane. I did not have a feeling of being Colombian. I had stronger feelings being Jewish, although I’m not a religious person. My father was a Jewish Orthodox who tried to inculcate religion with an iron hand, so the opposite happened. When I left home in 1946, I never went to a synagogue for praying again. New York was my total liberation. At first, I was at my aunt’s home in the Bronx. Gradually, I got a job as a messenger boy and got my own apartment. I worked in the daytime and went to night school to finish high school, and then to go to college. I kept applying for a scholarship, but in those years, veterans had priority, so I had to keep applying further and further west. Finally I got a scholarship at the University of Utah in Salt Lake City. I then went to UCLA. In college, I used to sell encyclopedias door to door. I had this passion for books which was contagious. I was able to make a lot of money selling books. While studying for my master’s degree at UCLA, I met a Japanese girl. I felt in love, and I asked her to marry me, but she said she needed her parents’ permission. She took me to Japan, but her parents said, “No.” So she abandoned me, but had I gone back with her, I would not have made a fortune in Japan in the book business. Japan in those days was converting from German to English as a reference language. So I began replacing all those German encyclopedias with American ones, which I imported, and eventually spread out into art books, engineering books, and many other books. Later, I had the partnership with an Italian publisher in Milan. I had a new love, whom I wanted to marry, but again could not get permission to marry in Japan. I had an offer to sell my company, which at that time had 2,000 salesmen and 50 offices all over Japan. So I sold the company, and we moved to Italy, but then I had a better opportunity for business in France, and we moved to Paris. Living in France, I became very interested in wine. I was given the name of one of the leaders of Napa Valley. By then I had become a serious art collector in Italy and France. I had purchased land on arriving in San Francisco, where I first started a home. Michael Graves won the award to build the temple to wine [Clos Pegase Winery] which became very popular and attracted much media attention. In fact, the Washington Post called it, “America’s first monument to wine as art,” because I had also filled it up with my art inside and outside. Then, in 2010, my wife passed away after 40 years together. And fortunately, I had known Maria, who I courted and eventually married. We’ve been married for three years, very happy years, and she has helped me in so many ways. She is my teacher, and I have a new life with her. Maria: I was born in Florence, Italy, with a bang—the day that Mussolini declared war. My early childhood was not easy, but it allowed me to appreciate little things that I have in my life now, and that I have had in the past 30 years. I went to school in Florence, and I got married for the first time (age 22) to an American citizen. Jan's karma was with [the] Japanese, my karma was with Americans, not with Italians. We started the business together, and it was designing, manufacturing, exporting, and marketing clothing. Again, I feel very fortunate because that was the foundation of my work and my career. So, after 10 years, I was married, [and] I was exhausted because I was running the company with 300 people, and I was very young. But I guess my entrepreneurship came out. I became a very close friend with Aldo Gucci—he made the Gucci name what it is today. I fell in love with a young student, and in Italy there was no divorce at that time in 1970. So, if I wanted to come to the United States (which I only had a permit [to enter] as a tourist), I had to go to Santo Domingo [in the Dominican Republic] to get a divorce that I was accepted in the United States. I had to leave everything behind me. So, I followed my heart, and I came in this country with $2,000 dollars and with my clothes and very little [else], but I didn’t care. I was happy and I got married immediately. As soon as I received the divorce, we went to Carson City, and we got married, and we had breakfast at Wendy's. That was our celebration of our marriage. But I was happy. I did not have money—nothing—but I was happy. I know how fortunate I am—most of all to be here in America. America is a land of opportunity. I love this country very, very much. I love the system. Everything is much faster. You can accomplish many more things if you have passion, if you work hard, if you are resilient. This country has done so much for me. I love this country, [and] I love Italy. I love the art, I love the food, you know, the passion. I love both cultures. I think. I learn. In Italy if you say, “How are you? Come stai?” they tell about all their problems. In America, when I came here, I remember I would meet somebody going in the elevator, and they would ask me, “How are you?” I would start telling them my problems and the person would already be gone. Now I’ve learned you just say, “Hi.” That’s it. In Italy, you go on and on and on. Now I don't. Here only with close friends I talk about problems. There is a difference and the first two years it was very difficult for me to adjust. Also, after 40 years, when I count, I still count in Italian. Uno. Due. Tre. It’s incredible. Why am I counting in Italian? When I entertain, I’m very Italian. When I do business, I’m very American. Jan: I am very, very proud of becoming an American. Maria: You could’ve been a French citizen because you lived so long in Paris. Jan: But since the age of 16, I had come to America. I went to high school here. I went to college. So America remained in my bones. I'm very proud to say that it’s the land of opportunity, and I was able to take advantage of that part.